Wolf Lodge is a condo development with 14 individual 2 story buildings with 12 units in each. Units range in size from 1-3 bedrooms. The complex also includes an outdoor pool, jacuzzi, mini-golf course, and newly-renovated clubhouse containing meeting space, additional bathrooms, and a small kitchen. This charming development is located along the 12th fairway at Wolf Creek Golf Course and is just a few miles away from world-class skiing at Powder Mountain, Snowbasin, and Nordic Valley ski resorts. 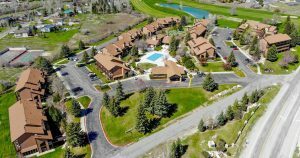 There are also miles of hiking and biking trails right out your front door, in addition to the spectacular mountain and valley views. Contact Destination Properties today if you are interested in buying or selling a unit in or around Wolf Lodge.